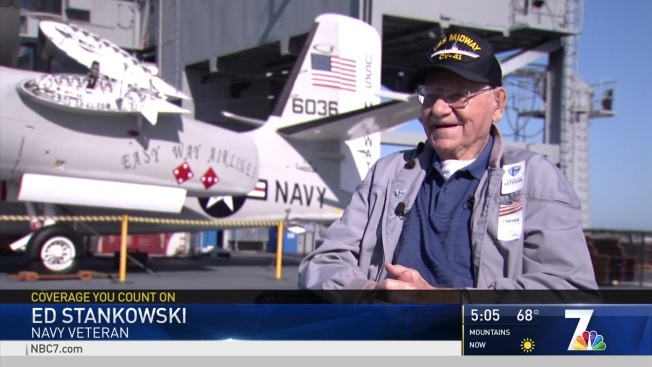 Navy veteran Ed Stankowski returned to USS Midway for the first time since serving on the ship's maiden voyage nearly 75 years ago. Stankowski was last aboard the aircraft carrier in 1945, but the moment the 97-year-old saw the carrier again memories came flooding back. “It was the biggest ship that we had in the Navy at the time and it was something to be a part of it,” Stankowski told NBC 7. He was joined by two of his 12 children, a grandchild, great grandchild and a few other family members on this trip from Wisconsin. Standing on USS Midway’s flight deck once again, Stankowski reminisced about watching aircraft catapult into the Pacific sky. “Planes would disappear because it went down a little bit and then came up,” he said with a chuckle. But the highlight of his personal tour on the carrier turned museum in San Diego Bay was seeing the radio room where he worked as a young sailor. “I was a radio man. I was teaching new recruits National Morse Code and the procedure they use for communicating,” Stankowski said. Stankowski lost his wife Lucile in January and his children thought a visit to the USS Midway Museum would be a good way to fill his heart with positive memories and help him heal. “I'm thinking he’s loving every minute of this,” Stankowski’s son Ken said.